Reflecting Josemaria Escriva's belief that God can be found in professional and everyday settings, The Way blends passages from sacred Scripture with anecdotes drawn from Escriva's life and work, snatches of conversation, and selections from his personal letters. The direct, conversational writing style and its deeply felt humanity are among the book's main attractions and beautifully convey the belief that the human is not foreign to the divine and that the fully Christian spiritual attitude can be described as unity of life. 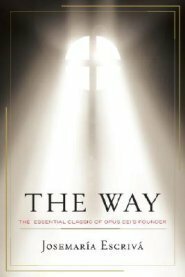 Since it was first published in 1939, more than four and a half million copies of The Way have been sold in forty-three different languages. This handsome paperback edition will take its place alongside such seminal works as John of the Cross's Dark Night of the Soul, Thomas a Kempis's Imitation of Christ, and Teresa of Avila's The Interior Castle.